Three men who sold illegal Premier League streams to more than 1,000 pubs, clubs and homes have been jailed. Steven King, Paul Rolston and Daniel Malone were given a combined total of 17 years, some of the longest sentences ever for piracy crimes. They made more than £5m from their websites. The judge called the operation a "dishonest, dodgy business", and said pub owners who used the streams were "profoundly dishonest". The three men sold the illegal streams to venues and homes in England and Wales over a period of ten years. They were all found guilty of conspiracy to defraud after a four-week trial at Warwick Crown Court. 51-year-old Steven King, of Siddeley Avenue, Coventry, was sentenced to seven years and four months. Paul Rolston, aged 54, of Pembroke Road, Coventry, got six years and four months. 42-year-old Daniel Malone, of Woodway Lane, Coventry, got three years and three months. They were trading under the names Dreambox (unincorporated), Dreambox TV Limited and Digital Switchover Limited. "The message is clear really - you will go to prison if you commit crimes like this," Kieron Sharp, the director general of anti-piracy organisation Fact, told Radio 1 Newsbeat's presenter Ben Mundy. He added: "It's about having to pay for a product that we all enjoy watching and want to see. The money that's in the game has made the product what it is. "If the money is not paid back by those who are watching it then we won't be seeing the football and other activities in future." There has been a big crackdown on illegal streaming of live football in the last few years. 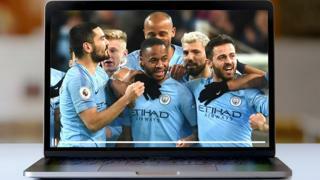 A blocking order which came in in 2017 means UK Internet Service Providers (ISPs) like BT, Virgin Media and Sky have to prevent people from illegally accessing streams of Premier League matches. The rates depend on factors including the size of the venue. The price has increased as the amount TV networks pay for the rights to show games has increased - the current deal, which is from 2016 to 2019, is worth more than £5bn for 168 games a season. A new deal running from 2019 to 2022 will be worth more than £4.5bn for 200 matches - we don't know the exact figure because Amazon hasn't said how much it paid for 20 matches. Premier League rights: What does Amazon deal mean for rivals, the league and fans?